After having tried a Topatop WCMT previously and loving the ease of use and overall design, I knew I would likely purchase one again at some point. I ended up choosing a full wrap conversion made from Didymos Waves for the panel, straps, and waist, as well as a reversible panel of Hoppediz Montreal print. I ordered a c-form hood and an in-between size when I placed my order. Alina gave me an estimated date of shipping the carrier, and I did not hear from her again until after that date had passed, when I followed up to see if it had been shipped, and requested tracking information. She provided me with tracking information which did not work, and I waited for nearly five weeks, and several follow-up requests to her with no response, before the carrier arrived. The only time she responded was when I asked for a refund if I did not have the carrier to me by a specific date, which it arrived before. When I opened the carrier, I noticed it had a flat hood and was the regular size, not an in-between. I contacted Alina and she refunded me for the extra I had paid for the hood. I decided to keep the carrier, as I had waited so long to receive it. Customer service and mistakes aside, Topatop is a well made product for the price charged. The wrap straps are comfortable, the cinching mechanism is perfect, and the waist strap is very comfortable. 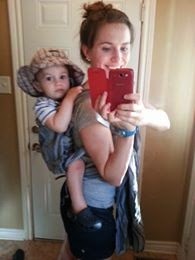 I have used this carrier from the time I received it until past 18 months with my youngest, and have always been able to get a comfortable carry, even for extended periods of time. I plan to keep this carrier in our collection until our babywearing days are over, as it is that versatile and comfortable. Recommendations: If you can find one of these on the second hand market and are looking for a great WCMT to try, buy it! It is well made and comfortable, and the price makes it easy to justify. If you are patient, try your luck at ordering a semi-custom from her wide selection of wraps on hand.